Will the Arctic Apple usher in a wave of genetically engineered fruits and vegetables? The planned February rollout of the non-browning Arctic Apple brings to the forefront an important question: Can genetic engineering help reduce the burgeoning worldwide food waste problem? Last year, UK supermarket giant Tesco revealed that apples are among the most wasted foods throughout the supply chain – around 40% of what’s produced (and even this seems conservative based on other food waste estimates). The Arctic Apple doesn’t brown when sliced, making it easier for consumers to finish their apples instead of throwing them out when they change color. Groups opposed to genetic engineering argue that the technology would disguise signals that the apple is turning bad, resulting in consumers eating unhealthy foods. At least in the case of GM apples, that’s not accurate. Apples turn brown when exposed to oxygen and water molecules in air because of an oxidation process managed by an enzyme, polyphenol oxidase. In most cases, slightly browned apples are fine to eat, but are discarded because of their color. Consumers often want only the freshest-looking produce, with no bruises. Supermarkets tend to reject entire crops of perfectly edible produce because of less-than-ideal size, shape or coloring. Common sales promotions also encourage consumers to purchase more, leading to spoilage at home. 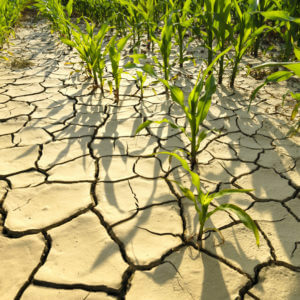 Food loss and waste also have a significant impact on the environment. The carbon footprint of wasted food is estimated at 3.3 gigatons. In fact, if food waste were a country, it would rank behind only the US and China for greenhouse gas emissions. 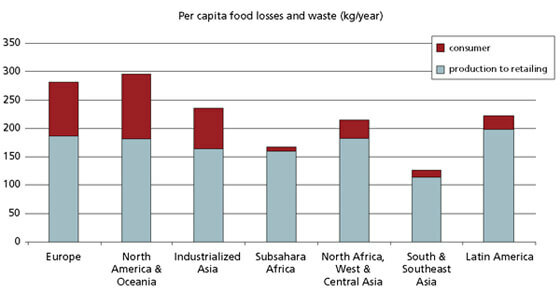 The production of wasted food also uses 28% of the world’s agricultural area. Progress is being made in other areas along the perception front. 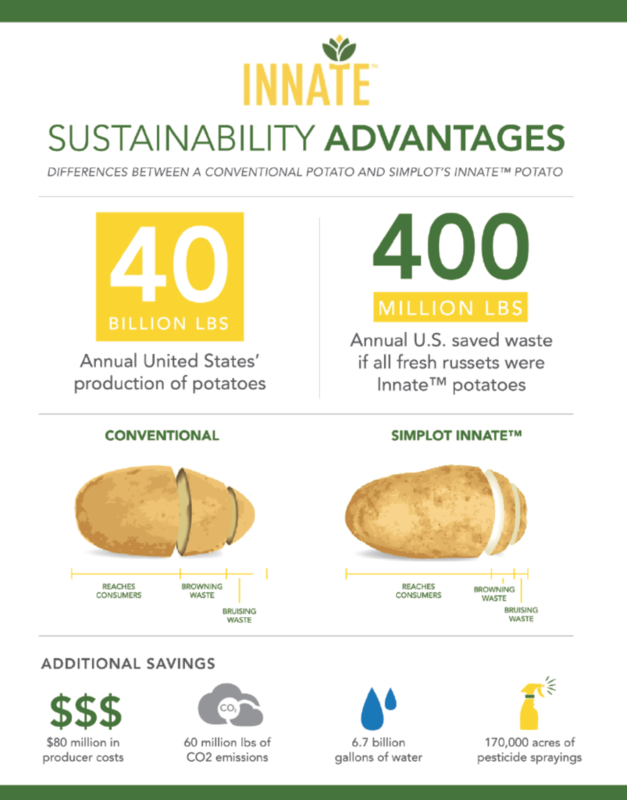 The Simplot potato, genetically engineered not to develop ugly black bruises, can potentially reduce the amount of potatoes wasted because consumers, and retailers such as McDonald’s, won’t buy potatoes that are blemished. However, anti-GMO groups have a launched a campaign trying to intimidate McDonald’s and other fast food companies from embracing this innovation, which would just perpetuate the food wastage cycle in high consumer nations. Hate buying a packaged fresh salad for later in the week only to pull it from your refrigerator and find it soggy and spoiled? 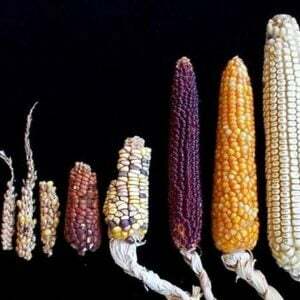 Genetics—conventional breeding and biotechnology—can help, and have a big impact on a wide range of other fruits and vegetables. Scientists have been working to delay fruit ripening to give farmers more flexibility in marketing their goods to consumers in search of garden fresh foods. 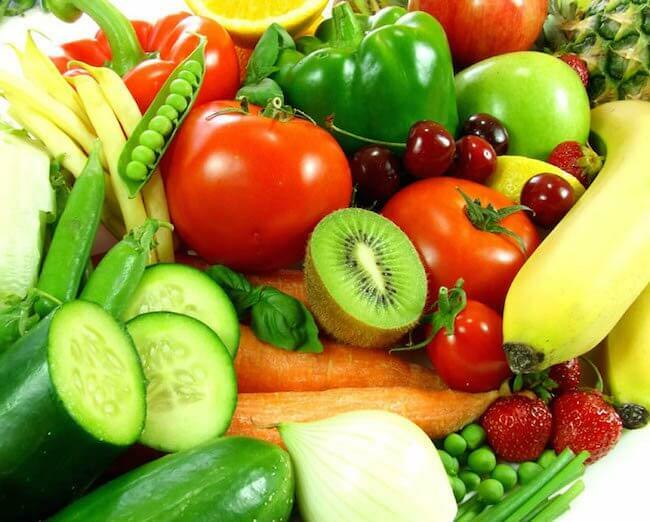 Ethylene is a natural plant hormone associated with growth, development and ripening of many plants. It’s involved in the ripening of a variety of fruits, including bananas, pineapples, tomatoes, mangoes, melons, and papayas. It’s produced in varying quantities — depending on the type of fruit — but when its concentration reaches 0.1-1.0 ppm (parts per million), the ripening process in climacteric fruits (those that continue ripening after harvest) is considered irreversible. Climacteric fruits are usually harvested once they reach maturity and then undergo rapid ripening during transit and storage. These include banana, mango, papaya and pineapple. Non-climacteric fruits do not ripen after harvest. These include strawberries and oranges. Scientists have identified numerous ways to control the ripening process. They are experimenting on manipulating the amount of ethylene produced by “switching off” or decreasing the production of ethylene through a variety of methods.. But there are other techniques too. 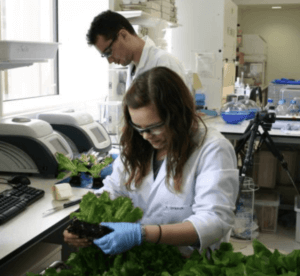 Scientists at the University of Southampton in England managed to extend the shelf life of lettuce, helping leaves stay fresh for more than a week. They found that smaller leaves with lots of cells packed closely together remain green, crisp and firm longer. Lead researcher Gail Taylor, a professor in plant biology figured out which genes are responsible for these characteristics. 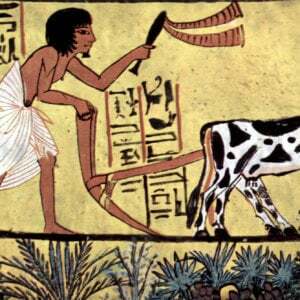 Each year, almost a third of the food produced for human consumption is lost or wasted, largely due to spoilage. Fresh produce is at the top of the list; the Food and Agriculture Organization of the United Nations (FAO) estimates that, each year, one-third of all food produced for human consumption in the world (around 1.3 billion tons) is lost or wasted. This includes 45% of all fruit and vegetables, 35% of fish and seafood, 30% of cereals, 20% of dairy products and 20% of meat. Food waste issues in less-developed nations are more complicated, occurring almost exclusively at the farmer and producer level. Inefficient harvesting, high temperatures and lack of infrastructure in sub-Saharan and Southeast Asian regions often lead to fruits and vegetables rotting and spoiling before they ever make it to market. Ripening is a normal phase in the maturation process of fruits and vegetables. Upon its onset, it only takes about a few days before the fruit or vegetable is considered inedible. 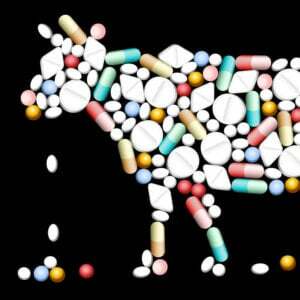 This unavoidable process brings significant losses to both farmers and consumers alike. Scientists have been working to delay fruit ripening so that farmers will have the flexibility in marketing their goods and ensure consumers of “fresh-from-the-garden” produce. 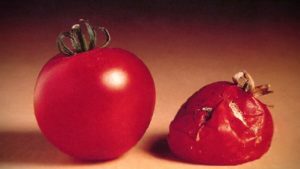 The first genetically modified crop available in stores, the Flavr Savr tomato, first sold in 1994, was engineered to retard ripening; it softened slowly and stayed fresh on supermarket shelves for long periods of time. The tomatoes were introduced in 1994, but subsequently taken off the market, diminishing scientific efforts to tackle food waste, a pressing global problem. But that product failure did not stop researchers from moving forward. A slow-ripening version of the Malaysian papaya, known to ripen too quickly for export, is currently in development. In 2012, scientists from the University of Leicester reported a breakthrough in their research efforts to help fruits and vegetables ripen more slowly when they identified a particular gene that controls the speed of ripening. Using thale cress, a small flowering plant, they showed that altering a particular gene could change the speed with which chloroplasts transform into other structures in plant cells, including those involved in the ripening of fruit. Manipulating the protein can change the rate at which tiny structures in plant cells develop and create the bright pigments which give ripened fruit its distinctive color, the Leicester scientists found. “This discovery brings us one step closer to greater control over ripening so that we have greater flexibility for farmers when supplying produces in the best condition,” said Douglas Kell, Chief Executive of the Biotechnology and Biological Sciences Research Council in the United Kingdom. Beyond its application as a slow ripening technology, fruits and vegetables could also be engineered to maintain an appetizing look. The scientists are evaluating their findings on tomatoes, bell peppers and citrus fruits. XiaoZhi Lim is a freelance journalist and former GLP editor.